USGS scientist sampling sediments for organotin analysis in a beaver pond on Red Bank Creek, Lexington County, South Carolina. The pond is downstream of the spill site. In 2000 the largest known spill of highly toxic organotin compounds occurred in South Carolina. The spill caused the shutdown of a municipal wastewater treatment plant and the closure of the City of Cayce's only drinking water intake. The organotin compounds spilled make up a suite of chemicals used in the manufacture of plastics, glass coatings, adhesives, and caulks. The compounds are also used in antifouling marine paint where their toxicity prevents the growth of nuisance organisms on the hulls of ships. The U.S. Geological Survey (USGS) partnered with the U.S. Environmental Protection Agency (EPA) to study the fate of the organotin compounds, such as tributyltin, in the freshwater ecosystem of Red Bank Creek, South Carolina. Because organotins are very toxic to nontarget organisms, such as oysters, the fate and toxicity of these compounds has been extensively studied in the marine or estuarine ecosystems where they are most likely to occur. In contrast, there was a void of information on the fate and toxicity of organotins in freshwater, which the joint USGS/EPA study help fill. Based on methods developed by the USGS's Toxic Substances Hydrology Program, the USGS and EPA scientists found that by 2003 the organotin compounds in the creek's ecosystem had naturally degraded to levels that were thousands of times less than the levels found just after the spill and consequently were below levels of concern. EPA used the results of this study as one of the deciding factors to select monitored natural attenuation as the remedial solution for the stream--a decision that saved millions of dollars. Removing the stream's contaminated sediments would have cost in excess of 10 million dollars. 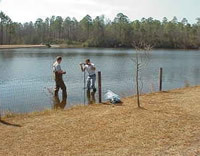 Collecting sediment samples from Crystal Lake, Lexington County, South Carolina. Landmeyer, J.E., Tanner, T.L., and Watt, B.E., 2004, Biotransformation of tributyltin to tin in freshwater river-bed sediments contaminated by an organotin release: Environmental Science and Technology, v. 38, no. 15, p. 4106-4112, doi: 10.1021/es030697z.